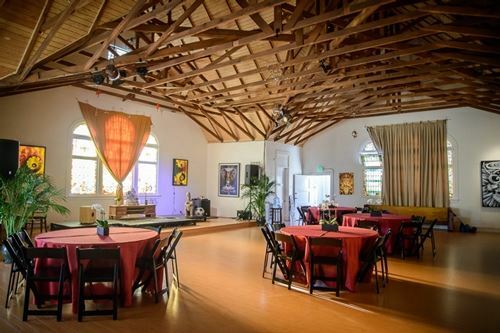 In April of 2014, Full Circle opened its doors in Venice, CA with the goal of creating a space to incubate new ideas, facilitate spiritual practice and art, and foster a deeper connection among the local community. Founder Andrew Keegan shifted focus from being a Hollywood actor to a community activator, building a space for innovators to gather. In less than a year, Full Circle has the eyes of the nation curiously watching. Recent feature stories in Millennial Magazine, New York Magazine, LA Times and ABC’s Nightline have propelled Full Circle into popular culture. Full Circle is located in a 110-year old church two blocks from the ocean in beautiful Venice Beach. The facility offers yoga, music, and growth-oriented workshops. Full Circle is also host to an art gallery; all rentable spaces come curated. Full Circle’s special event venues and services are available to corporations, non-profit organizations, and government groups. Non-profit organizations with proof of their 501 (c) (3) status and government groups with the appropriate documentation qualify for a 10% discount. A deposit of 50% of total cost will be due upon signing of contract. The remaining balance will be due five (5) days prior to the event. Full Circle spaces are available for hosting, among other types of event. The Sanctuary & Spiral Lounge Weekday Hourly Rate (Mon-Thurs) $220 Weekend Hourly Rate (Fri-Sun) $320 Full Circle is pleased to offer the following complimentary services for all flat-rate rentals: - One Full Circle Event Coordinator will be on site throughout the event - Marketing and promotion on the Full Circle Venice Online Event Calendar - Full-service furniture and equipment rentals and coordination through Signature Party Rentals, Full Circle’s exclusive rental company - Vendors for catering, music, lighting, design, and floral needs - Grab and Go Bar with healthy snacks and beverages. All proceeds go to Full Circle. Large 1 bedroom apartment with kitchenette and bathroom, immediately adjacent to Sanctuary. Full Circle is pleased to offer the following complimentary services for all flat-rate rentals: - One Full Circle Event Coordinator will be on site throughout the event - Marketing and promotion on the Full Circle Venice Online Event Calendar - Full-service furniture and equipment rentals and coordination through Signature Party Rentals, Full Circle’s exclusive rental company - Vendors for catering, music, lighting, design, and floral needs - Grab and Go Bar with healthy snacks and beverages. All proceeds go to Full Circle. $50/hour Weekday $75/hour Weekend $150 flat rate to add on to rental of the Sanctuary or Spiral Lounge (regardless of length of rental). Large 1 bedroom apartment with kitchenette and bathroom, immediately adjacent to Sanctuary. The renovated interior of a 110-year old temple, The Sanctuary is a wide open space with a stage, open to host all events, from a wedding to a film screening to a yoga class.